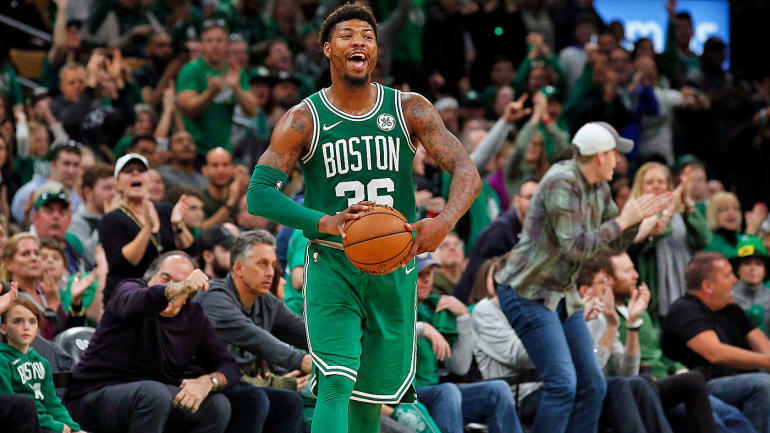 The Boston Celtics were dealt some devastating news before the postseason got underway when it was revealed that guard Marcus Smart would miss four to six weeks with an oblique injury. It’s quite possible that Smart will miss the first two rounds of the playoffs if the timetable holds true. On Tuesday, Smart spoke to the media about his injury and admitted that it’s definitely a “frustrating” situation to be in. The veteran shooting guard suffered the oblique injury against the Orlando Magic back on April 7 in a game that Boston didn’t really need to win. Smart missed the regular season finale against the Washington Wizards following that and should continue to be out of the lineup for the majority of the postseason. Smart is expected to miss the opening two rounds of the postseason, which includes Boston’s current series against the Indiana Pacers. Prior to his injury, Smart put together averages of 8.9 points, 4.0 assists, and 2.9 rebounds while shooting 36.4 percent from beyond the arc. During the regular season, Smart was the team’s starting shooting guard, which allowed Gordon Hayward to shift to a bench role. While it’s an uphill battle for Smart to return, it’s one that he’s hoping to take one step at a time. Smart is certainly a huge loss for the Celtics from a leadership and defensive standpoint alone. However, Boston has fared just fine so far as they came away with an 84-74 Game 1 victory and held Indiana to just a 33.3 percent shooting clip.